VitalSoftTech.com is where Natik posts tips, thoughts and technical advice on managing Oracle Databases and administering Oracle GoldenGate Replication. The aim is to teach junior, senior level DBA’s and developers new database features and show them how to manage complex environments to help leapfrog their careers. There are over 300 articles posted on this blog. 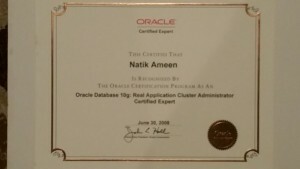 Natik Ameen is one of the VitalSoftTech’s Oracle Internal Experts. He is an Oracle Production DBA, Exadata Machine Adminstrator (DMA), a Certified RAC Expert (OCE), and a DBA track Certification trainer for over 16 years. Lately he has been working in the BigData echosystem, specifically Cassandra, Spark and Hadoop. 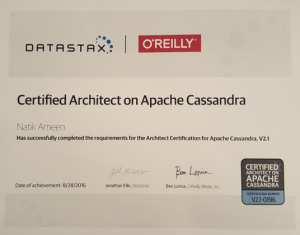 Some of the Certifications he holds in BigData are below. He is an Oracle Evangelist and has presented at IOUG and UTOUG conferences on topics such as Oracle 12c, Real Application Clusters (RAC), GoldenGate 12c and Cloud Technology. He has worked with or consulted with the biggest brands you know, including Sony USA, Sony Pictures, Sony Online Entertainment, Sony Playstation Network, Verizon, University of California, George Washington University and many more. Here are the highlights of some of the projects that he has worked on. He helped convert the application to support active-active instances in a RAC cluster. Proactivy identifed waits such as inter-instance locking, sequence thrashing, index contention, etc. Integral part of the migration project to move a database across platforms from Solaris to Linux with minimum downtime using GoldenGate. Hardened OLTP database including disabling features, removing unused options and alerting on suspicious activity. And much more. He is very passionate about Database Technology and has written several white papers on Oracle 12c, Oracle RAC and GoldenGate. His papers are published at IOUG. Stay connected with Natik at LinkedIn.